Islamic Archives - The Friends of Islam - The result of friendship with Ahab! The result of friendship with Ahab! Following the September 11th atrocity the British media followed a mixed pattern - some pointing out the hypocrisy of Islam while others followed the path of Professor John Casey, showing his pro-Islamic bent in the Daily Mail. Although our letter was never going to be printed, we were grateful to see Christians zealous enough to write and complain about Casey's clear bias and historical leanings towards the Tony Blair white-washed view. 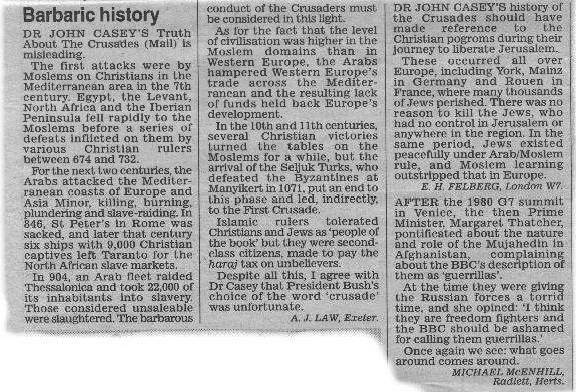 Is Professor John Casey (the Daily Mail, Wednesday, 12th September) serious when he proposes that Islam has 'usually …extended to Christians and Jews - the 'people of the book' - a high degree of toleration which Christians have begun to reciprocate only quite recently'? Whenever Islamic fundamentalism regains dominance, the nation is plunged back into the 'dark ages' of seventh-century Arabia. Iran is an obvious example of what happens to a nation when the Islamic clergy take over the government. The despots of the Ottoman Empire, and the plethora of dictators who have made life hell in Libya, Jordan, Iran, Iraq, Syria, Sudan, Yemen, Afghanistan, etc., are merely examples of seventh-century Arabian tyranny transplanted into modern times. Because there was no concept of personal freedom or civil rights in the tribal life of seventh-century Arabia, Islamic law does not recognise freedom of speech, freedom of religion, freedom of assembly, or freedom of the press. This is why non-Muslims, such as Christians or Bahais, are routinely denied even the most basic civil rights. Christians are not even allowed to build churches in Muslim countries and are constantly persecuted, as recent events in Sudan and Pakistan testify. Compare this with the freedom Islam has to build mosques and worship freely in the West! In the West, people are also free to protest about the action of their government. This is why thousands of people were allowed to protest against the Gulf War - they had the freedom of speech and assembly to do so. But what if they lived in an Islamic country such as Saudi Arabia? There was no freedom to protest the war in Saudi Arabia. The Associated Press reported on February 2, 1991: 'Prince Nazef had warned that anyone undermining the kingdom's security would be executed or have a hand and a leg cut off.' There was no punishment for those who freely protested against the war in the West! Most sickening of all was the news that, a few months after the war ended and we had finishing baling their sorry backsides out of Saddam Hussain's hands, a 15 year old boy was hung in Saudi Arabia for becoming a Christian! The news of regular atrocities of this kind filter out of Muslim countries. Witness the deaths of drug smugglers by unnecessary tortuous strangulation in the British press in the last week! Incarceration without due process; the use of torture; political assassination; the cutting off of hands, feet, ears, tongues, and heads; gouging out of eyes; stoning to death for adultery -- all of these things are part of Islamic law today because they were part of seventh-century Arabian culture. To Westerners, such things are barbaric and should not have any place in the modern world. Muslims do not regard killing a person as wrong in itself. It is wrong if the person is a kinsman or of an allied group; and in Islam this means the killing of any Muslim believer. They have a traditional fear of retaliation and were careful in the past not to kill a member of a strong tribe, but where they feel powerful they have no compunction not to kill. Islam is a distinctively Arabian cultural religion. Unless this is firmly grasped, no real understanding of Islam is possible. Unless this fundamental point is understood, Western people will never understand why Muslims think and act the way they do. We should not forget the plight of Salman Rushdie as a modern example of Islamic violence. To receive a death sentence for writing a book which gives an unfavourable view of Muhammad is something a Westerner can neither understand nor tolerate. But to an Arab Muslim, it makes perfect sense. Why did Rushdie use the title 'The Satanic Verses' - and why did it lead to this furious reaction from fundamentalists? In order to appease his pagan family members and the members of the Quraysh tribe, the 'prophet' Muhammad decided that the best thing he could do was to admit that it was perfectly proper to pray to and worship the three daughters of Allah, the moon god his tribe already worshipped. These goddesses were named: Al-Lat, Al-Uzza, and Manat. This led to the famous 'satanic verses' in which Muhammad, in a moment of weakness and supposedly under the inspiration of Satan (according to early Muslim authorities), succumbed to the temptation to appease the pagan mobs in Mecca (Sura 53:19). The literature on the 'satanic verses' is so vast that an entire book could be written just on this one issue. Every general and Islamic reference work, Muslim or Western, deals with it as well as all the biographies of Muhammad. The story of Muhammad's temporary appeasement of the pagans by allowing them their polytheism cannot be ignored or denied. It is a fact of history that is supported by most Middle East scholars, Western and Muslim, and only a few modern Muslim apologists reject this history. But they cannot do so on the basis of any historical or textual evidence. Their objection is based solely on the grounds that Muhammad was sinless and therefore could not have done this! When his disciples at Medina heard of Mohammad's fall into polytheism, they rushed to him with rebukes and counsel. Muhammad would later claim that Gabriel himself came down from heaven and rebuked him for allowing Satan to inspire him to concede to the Meccan worship of the daughters of Allah. He then reverted back to his monotheism and stated that Allah can 'abrogate,' that is, cancel, a past revelation. After Muhammad's death, the 'satanic verses' were not included in the text of Quran. They were abrogated! This, of course, led to endless ridicule. The pagan Meccans pointed out with glee that Muhammad's 'Allah' simply could not make up his mind: At an earlier date, Muhammad had claimed that Allah said they could not worship the three daughters of Allah. Then Allah said that they could worship the three daughters. And now, once again, they were being told that they could not worship the three daughters. Cannot Allah make up his mind? Exactly the same pattern exists in the history of the 'American Muhammad', self-styled Mormon 'prophet' Joseph Smith! You will not find a single Biblical prophet or apostle guilty of such contradiction.